Thousands of guitarists have walked in the footsteps of Eric Clapton, Jeff Beck and Jimmy Page; but only Top Topham can claim they walked in his. 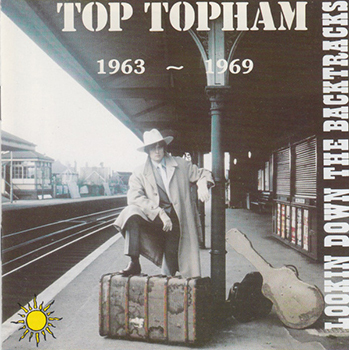 So begin the notes to this retrospective (1963-1969) look at the work of original Yardbirds' guitarist, Top Topham. I am usually ambivalent toward compilations of this nature because, whilst I understand the commercial justification for releasing previously unissued material, invariably it has remained so for good reason. Either the recordings are poor, or the material sub-standard. This is exactly what I feared when listening to the first track, Mance Lipscombe's "Sugar Babe". Recorded using a home Grundig the young Topham, vocally, comes over like a poor man's Woody Guthrie or Ramblin' Jack Elliot. There can be no denying the sincerity with which the number is performed but, personally, I'd never have included this. However, once past that, there are four unknown items from 1965-66 by the late Duster Bennett featuring Top on lead guitar with Tony Hills playing drums on three. Although the recording quality leaves much to be desired there's a superb six minute version of "How Blue Can You Get" and a Juke Boy Bonner pastiche, "Tell Me Sweet Mama", reinforcing my long held opinion that when British blues lost Bennett to a car crash, it lost a genius. 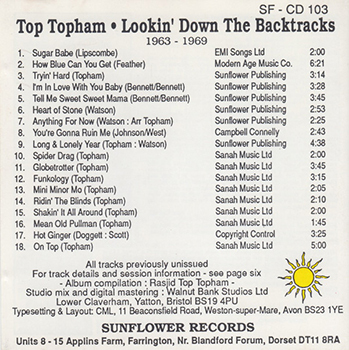 There follow four selections from 1969 featuring the vocals of Lloyd Watson fronting a quartet of Topham, a pianist, bassist and drummer. The recording quality and professionalism move up yet another gear and Top's work on Lazy Lester's "You're Gonna Ruin Me Baby", deserves special mention. The cream, however, comes last and is a must for all fans of blues guitar. Nine instrumentals featuring Top's immaculate playing, with sympathetic, understated rhythm guitar accompaniment from Rick Hayward. Seven of these were on Top's Blue Horizon concept L.P. "Ascension Heights", but what we have here are the original demos – and all the better for it. From the brilliant Lonnie Johnson/Eddie Lang inspired "Spider Drag", through the Santo & Johnny feel of "Globetrotter", via the myriad of pre-war blues styles, as featured in "Ridin' The Blinds", to a mixture of them all with, "On Top". Topham's feel for, and understanding of, the blues cuts through each like a razor blade. I'm not surprised Mike Vernon instantly signed him to rub shoulders with the likes of Fleetwood Mac for Blue Horizon - on this showing Topham was an immeasurable talent. He still is today and what's required now is a new recording to do justice to a guitarist who's been in the British blues wilderness for far too long. If you are at all unsure as to whether this is for you, I'll make the following recommendation and prediction. When next Top Topham and Bob Pearce play in the locality, go and see them .... I bet you'll come away from that gig with this CD in your hand.